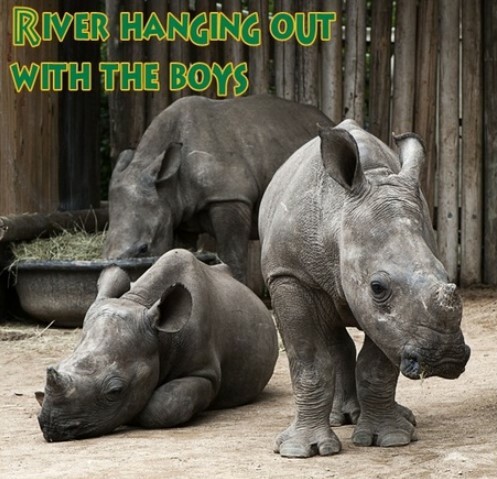 Baby Rhino River at Baby Rhino Rescue | Adopt and Donate Now! River arrived at Care for Wild Africa in August 2014, orphaned when poachers killed her mother. She was only a month old, very small and alone in the bush. Jackals attacked and wounded her.River was so desperate after a week of trying to survive that she wandered into the road and sought help from some tourists, lying down in the shade of their car. They gave her water and called rangers and she was transported to C4WA. She achieved Facebook fame when a ranger in the Kruger Park posted her rescue story. When River arrived at the sanctuary she was thin and very dehydrated. Confused and upset, she cried the entire time. She was placed into the crate, given liquids, kept warm. “She needed to go back into the safety of the womb,” Petronel explained. There was a volunteer by her side at all times. At the end of the four days she took a milk bottle and drank well. Then she was introduced into the enclosure with Thor, the little black rhino. River needed time before she could truly relax; she continued to jump at the smallest movements. It was necessary to walk carefully around her, so as not to startle her. Thankfully, River settled down. She shares her night pen with Thor, and the little white rhino and little black rhino have become very bonded. They love one another deeply and sleep lined up against one another. 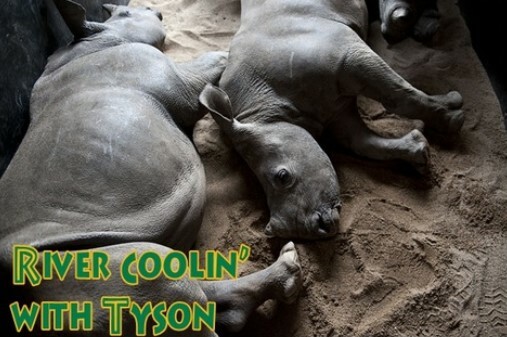 A new rhino has joined their family; he is big and beautiful and his name is Tyson. River has two lovely boys by her side. Her anxiety has been replaced with peace. They are in a new boma, with succulent grass and a huge mud bath. During the day they wander in the fields, complete with green grass and mango trees to lie under. When watching River and seeing her so happy, one realizes what a miracle is taking place at Care for Wild Africa.